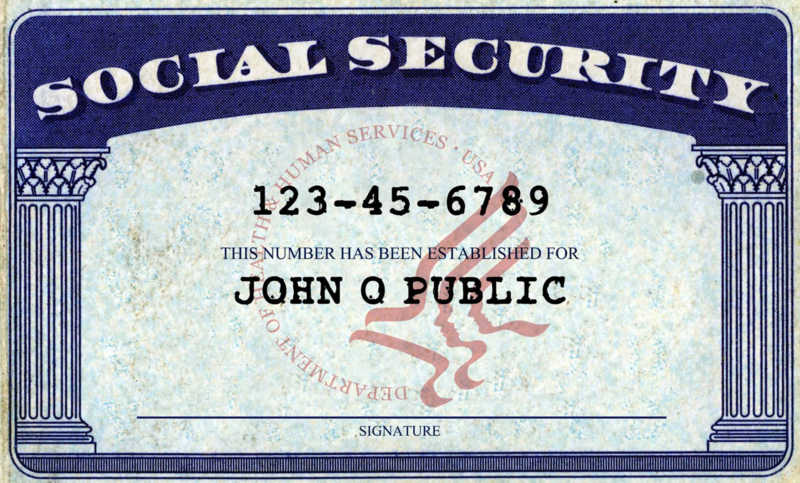 Before we dive into the Social Security 2100 Act, let’s recap some of the history of Social Security and its current financial status. On August 14, 1935, President Franklin D. Roosevelt signed the Social Security Act into law. Initially, Social Security covered only old-age assistance and survivors, with the retirement age set at 65. At the time, the average life expectancy in the United States was 61 years of age. Disability insurance was added in August 1956. The Supplemental Security Income program was created in 1972. These social insurance programs are administered by the Social Security Administration. There are other programs -- including Medicare, Medicaid, and Temporary Assistance for Needy Families (TANF) -- that were created by amendments to the Social Security Act. These programs, however, are administered by other agencies. Medicare and Medicare, for example, are administered by the Centers for Medicare and Medicare Services (CMS), which is housed under the Department of Health and Human Services. Social Security benefits are paid out of two separate trust funds, the Old-Age and Survivors Insurance (OASI) Trust Fund and the Disability Insurance (DI) Trust Fund. 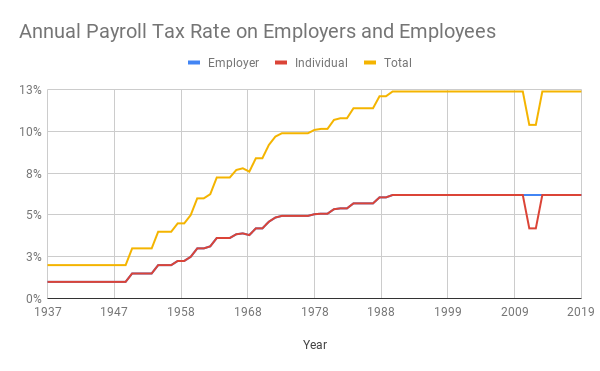 These trust funds are largely through the taxation of wage under the Federal Insurance Contributions Act (FICA), more commonly known as the “payroll tax.” When Social Security was created, the payroll tax was 2 percent of gross income, split between the employer and employee, up to $3,000, or about $51,667 in 2017. Today, the payroll tax is 12.4 percent of gross income up to $132,900. As we’re reminded every year when the Social Security and Medicare trustees report comes out, Social Security faces significant funding problems. This is because there aren’t enough people working to sustain the number of beneficiaries. In 1945, there were 41.9 covered workers per beneficiary. 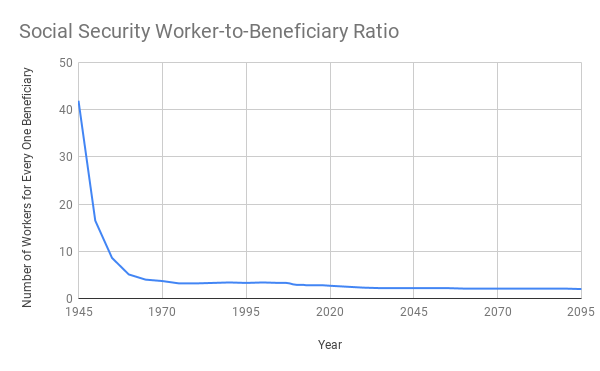 In 2018, there were 2.8 workers per beneficiary, and that ratio is expected to continue to decline. We’re also living a lot longer. The average life expectancy in 2016 was 78.69 years. We’re also not producing as many children as we used to. According to the 2018 report, Social Security faces $13.2 trillion in unfunded liabilities over the next 75 years. Some may say that this isn’t a big deal. After all, 75 years is a long time. But the concern is actually rather immediate. The DI Trust Fund will be depleted in 2032 and will pay out 96 percent of benefits. The OASI Trust Fund will follow suit in 2034, at which point be able to pay out only 77 percent of benefits. This brings us to the Social Security 2100 Act. The bill was introduced in February by Rep. John Larson (D-Ct.), who chairs the House Subcommittee on Social Security. The Social Security 2100 Act would expand Social Security benefits, change how the cost-of-living adjustment (COLA) is calculated, incrementally increase the payroll tax on employers and employees to 7.4 from 6.2 percent by 2043, gradually eliminate the wage cap, and combine the existing Social Security trust funds into a single trust fund. Overall, the Social Security 2100 Act would increase taxes by $18.9 trillion over the 75-year period scored by the Office of the Chief Actuary of Social Security. The bill would increase benefits on net by $3.7 trillion over the time frame. It would eliminate the current unfunded liability of $13.2 trillion and create a surplus of $2.1 trillion. All of that may sound good, but the chief actuary doesn’t score dynamic impacts on the economy. The payroll tax increase will hit every American employer, regardless of size, and employee, regardless of income level. This will have a markedly negative impact. Andrew Biggs of the American Enterprise Institute mentioned this in his written testimony last week to the subcommittee. Whether it’s the Social Security 2100 Act or Sen. Bernie Sanders’ (I-Vt.) proposal, the Social Security Expansion Act, phasing out and/or eliminating the wage cap is a priority of Democrats. The wage cap, currently $132,900, gradually rises every year with inflation. Every dollar earned beyond this amount is not subject to the payroll tax. Democrats see the elimination of the wage cap as a way to bring in more money for Social Security. 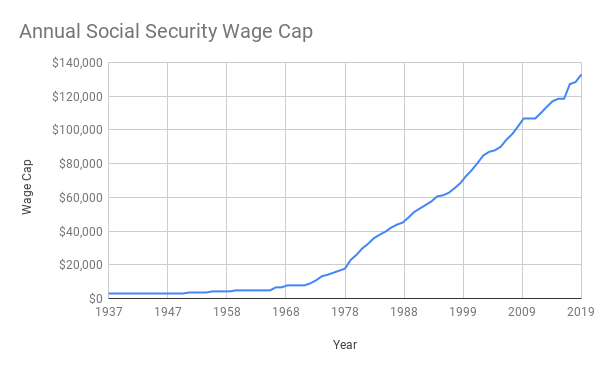 In the case of the Social Security 2100 Act, the wage cap would be eliminated for wages above $400,000. Wages under this level aren’t indexed to inflation, so, over time, the wage cap would be eliminated. The chief actuary estimates that this will happen around 2048. This would have the effect of increasing the top marginal income tax rate by almost 15 percent. The top marginal rate will be 37 percent until January 1, 2026, at which point it will rise to 39.6 percent. Assuming the top marginal rate the individual tax code changes under the Tax Cuts and Jobs Act aren’t made permanent, this means the top marginal tax rate will effectively be 54.4 percent. Democrats’ focus on this isn’t surprising. After all, they want to soak higher income earners, the top 3 percent of whom already pay 51 percent of all individual income taxes, with even more taxes. The fact is, many countries, if not most, have a cap on taxable wages for their social insurance programs. In Canada, taxable wages were capped at $55,300 in 2017, or $41,126 in U.S. dollars. In Sweden, taxable wages were capped at 504,375 kronor, or $61,373 in U.S. dollars. Even in Germany’s vaunted social insurance system, taxable wages are capped at €78,000, or $93,433 in U.S. dollars. There are much better ways to address Social Security’s insolvency than the Social Security 2100 Act. Back in December 2016, then-Rep. Sam Johnson (R-Texas) introduced the Social Security Reform Act, which increased benefits and raised the retirement age to 69 for those who turned 62 in 2023. The bill means-tested benefits for higher income earners through a lower COLA increase and lower payouts to higher income survivors. Importantly, the Social Security Reform Act didn’t raise taxes, and it still created a $600 billion surplus for the program. This was a better way to reform Social Security, but since it doesn’t involve a tax hike, Democrats and special interest groups, who constantly rely on scaring seniors to push their policies, blasted it. In the end, the Social Security 2100 Act may get a vote in the House, but it won’t go anywhere in the Senate. Of course, that’s the point. It’s not a serious proposal; it’s a messaging bill that Democrats want to use ahead of the 2020 presidential election. We need to have a serious conversation about the sustainability of Social Security, but the Social Security 2100 Act just is a barrier to that conversation.